﻿ How to Partner with Larger Brands to Grow Your Small Marketing Agency » Red Mango Marketing! Partnering with a larger company is like having a tall older sibling: they can give you a leg up to reach the treats on those higher shelves. For your business, those treats could be new customers that you’re not normally reaching, new ways of looking at your target market, and drawing on the reputation of the more established brand to convince more customers to work with you. Once you start gaining new partnerships with other businesses, others are sure to follow. Just like a sibling’s friends are often your friends too, brand partnerships will attract more brand partnerships. A well-known company’s network of potential customers and other companies can eventually become yours with the right partnership. Like your sibling vouching for you to friends, you can piggyback on a partner brand’s trusted reputation and stand out to potential clients through co-branding. A trusted reputation could open doors you never knew were even there. Not only can this bring in new customers, it can also reinforce your marketing to existing customers. If they’ve already made a purchase, your business may not be as top of mind as it needs to be to garner another sale. If a partner brand gets the right co-branded message in front of your existing customer, it could refresh interest and help them return to you. This cycle can keep compounding the effects of your retargeting as you add more partners and grow your customer network. A solid marketing strategy must grow over time, slowly being perfected with experiment after experiment until it works. Like a parent taking it easier on the second child, your business can rise to the top more easily by looking at what’s worked for your partner brands, but also what hasn’t worked. Best practices and strategic advice are invaluable, and businesses can partner together to share knowledge and help each other succeed. Simply put, established companies know what works and what doesn’t. Even if they’re in a different industry than yours, making them a partner can nurture cross-pollination of business practices so you can tailor a superior strategy to fit your needs. You may even get the chance to look at the insights that prove which strategies worked and which didn’t. Watch two siblings build a fort, and you’ll see that when they come together to accomplish a shared goal, nothing gets in the way. The best partners share resources, experience, and people to grow both businesses together. A common goal helps to enhance each business strategy and brings the chance of success closer within reach. We all want to provide a better experience for our customers, but it takes shared resources and a coordinated team to get it done. Being aligned with like-minded individuals is what elevates businesses struggling to make it on their own, to pillars of success with far-reaching networks of customers and partners. Marketing involves countless hours of research and trial and error. Without this insight, your marketing business won’t have the information or tools it needs to stay ahead of competitors and stand out to potential clients. Partnering with established brands can help you design marketing campaigns that work, drive big results and, above all, help your customers be more successful. Check out the Constant Contact partner program for resources, support, and education so you can bring on new clients, increase revenue from existing clients, and keep your clients longer. Find out how to get started today. 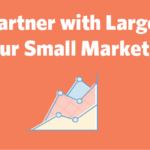 The post How to Partner with Larger Brands to Grow Your Small Marketing Agency appeared first on Constant Contact Blogs. This entry was posted on Friday, March 2nd, 2018 at 8:42 am	and is filed under News & Updates, Relationship Marketing, Solution Providers. You can follow any responses to this entry through the RSS 2.0 feed. Both comments and pings are currently closed.